Home Column jQuery List Forms SharePoint SharePoint 2007 SharePoint 2010 SharePoint 2013 SharePoint 2016 SharePoint Designer How to Make SharePoint List Column (Form Field) Read Only? How to Make SharePoint List Column (Form Field) Read Only? 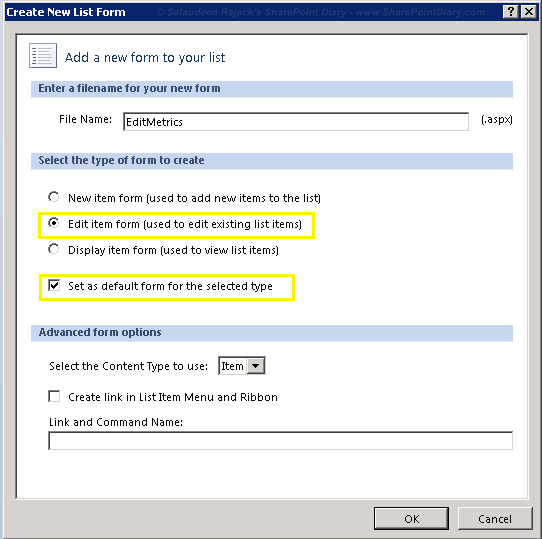 Using SharePoint designer to set field read only in list forms. See the detailed implementation at: Hide Columns in SharePoint List NewForm, EditForm and DispForms. But the problem is: As soon as you set "ReadOnlyField" to true, field will be hidden from all list forms and list settings. Instead, make the "ShowInNewForm" and "ShowInEditForm" Properties to False to hide them from NewForm.aspx and EditForm.aspx but still make it visible on list settings and DispForm.aspx. Alternatively, you can create a Field with ReadOnly Property and add the field wherever required. $SPcolumn = '<Field Type="Number" DisplayName="Project ID" Required="FALSE"
Indexed="FALSE" Min="1" Max="10000" Group="Crescent PMO Site Columns"
However, these methods not satisfying our requirement. What we want is the field to be present in all SharePoint list forms with "Read-only" mode! So, lets see help from jQuery solution. 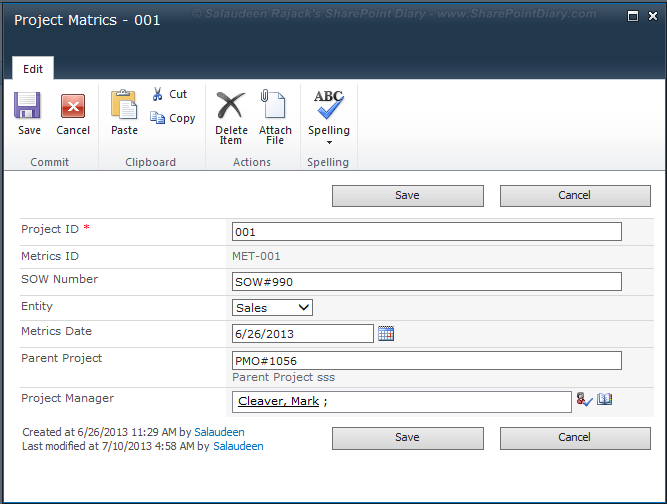 To make a column read only, Place the below code in a text file, upload to any SharePoint library, Add a CEWP to the "NewForm.Aspx" and/or "EditForm.aspx" or wherever required. Specify this script as "Content Link" from content editor web part properties pane. Navigate to the List. Under the "Forms" section, click on "New"
Create a new EditForm by giving it a name, and choosing other properties in the below screen. Change the "DisplayMode" property from "Edit" to "Display" in the properties pane. i used the jquery solution and it worked fine. How must be the code if i wanna set more than one column as read only? that's a great solution. Is it possible to make look-up columns and people picker as read only. This are the only types of columns where the code doesn't work. I used your SharePoint Designer solution and it worked perfectly. THANK YOU! Using Jquery it works..but its still possible to alter the text by enabling the field from read only to editable using developer toolbar and then the field value can be changed. Do you have any idea how to prevent it? I need to disable a text box based on the dropdown selected. Can u help me in this?? Used the designer solutions, works great! Thanks for this post! This script is not working on the Datasheet view, could you please modify the script duly to accommodate that as well? Is it possible to make the field read only after first entry using jquery? Hello, I also need to do the above. I want a specific field to be editable at first and then mark the field as read only. Would really appreciate the help! How can I set column level permissions ? For instance, certain columns hidden to some users or read only but open for edit for some folks. The jQuery code isn't working for some reason, I even insert a column with the name Metrics ID to test it. Can you help me? The name of the column I want as read only is 'Country'. Is there a limit as to the amount of columns that can be made read-only as well? The code you provided doesn't work for my Choice input. I've tried this before and it didn't work. However, other approaches for selection have worked using jQuery. I just want to say I like your thorough explanation and screenshots, it makes everything very clear. Is it possible to modify the field properties directly from SharePoint site settings or SharePoint Designer without touching the Form ? If you need a non-code solution: If I want to make "Country" read-only, I add a field "CountryReadOnly". Type: Calculated field. Value: Country field. Then I hide the field Country in the content type. Deny users the right to create views.